These look like Khandvis, because they are Khandvis… only I have layered them & stuffed them. Basic old recipes are treasures, however sometimes when that adventurous itch rears it’s head, I need to give in to my temptations to the looming who knows what will happen. Sometimes the adventure is a disaster, other times quite fulfilling. This was during those times, when I got a little itchy… & the itchy witch was pretty daring for I had never made Khandvis before! Along with the” first time” of making Khandvis, came the desire to deviate. I must say & as you can see – I was happy to hop this time. 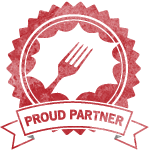 So why shy away from trying something new & delicious from the traditional base recipes? 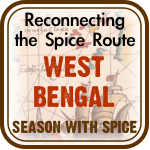 This is a quick microwave version, which I had seen in Sia’s Blog (Monsoon Spice). I have followed her recipe, but layered these with Mint & Coriander Chutney & spread some coarsely ground/very finely chopped lightly toasted almonds on them, before I rolled these up. So what do you say to a little piece of this Layered & Health Stuffed Chickpea Swirl ? These are really great for parties or to stuff yourself till you are full. Everyone knows the health benefits of chickpeas, not to talk about some fresh chutney or pesto & almonds. Prepare them ahead, cut them into bite size pieces, serve them on a toothpick at room temperature & see them disappear soon…Sending these healthy bites to HOTM, hosted by Michelle of The Accidental Scientist. The Theme is Finger Foods this time. This time I made 2 sets of these, one with the layer & stuffing & the other just the plain original way. Take gram/chickpea flour, turmeric powder, chilli and ginger paste, hing/asafoetida and salt to taste in a microwave safe bowl and mix well. Add butter milk to the mixture and whisk well with a egg beater. This takes a few minutes and Please make sure there are absolutley no lumps in the batter. The batter should be runny. Place the bowl in a microwave and cook at high speed for 5 mins. Remove and mix the contents well again with an egg beater. Place the bowl of batter again in a microwave and cook uncovered for another 5 mins. Mix well and check if you can spread them thinly. If the mixture is still runny & feels & smell uncooked, place it again in microwave and cook for another 2-4 minutess. Spread the thick batter quickly on the back of steel plates or glass chopping bowl or the foil. Spread it as thinly as possible. Let it cool for 2-3 minutes. This is a very quick process, so keep everything you need at hand & you have to work fast. The entire thing will take less than 12 minutes. Spread a thin layer of Chutney or Pesto, whatever you are using on the batter layer. Here Please make sure that the chutney or the Pesto is not watery & runny, but thick. 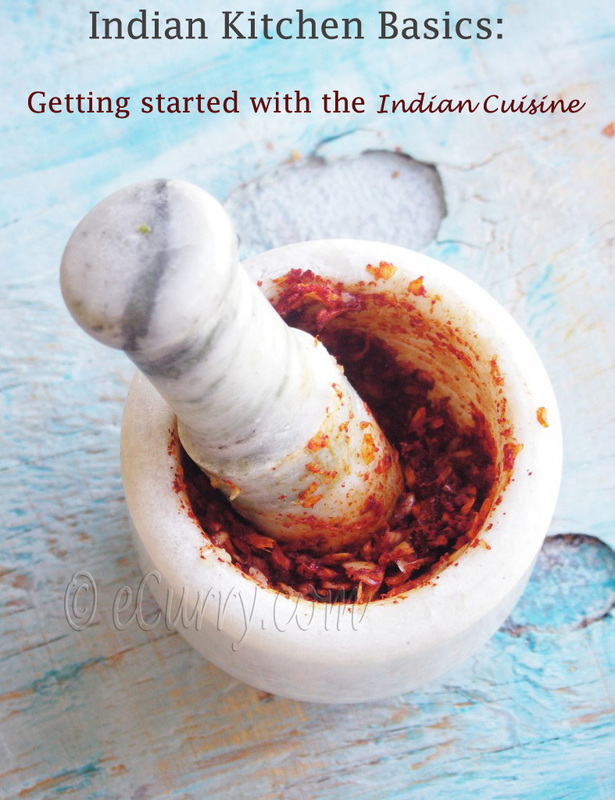 Sprinkle the coarsely ground toasted almonds in a thin even layer over the chutney/pesto. Make sure that all these layers are thin, or you are not going to be able to roll as you have to do in the next step. Then slice them with knife into 1-1.5 inch long stripes and roll each stripe neatly. Place each rolls in a serving dish. Heat oil in a skillet and add mustard seeds to it. When mustard starts to pop and splutter, add the sesame seeds & switch off the heat. Quickly add chopped green chillies and the curry leaves. 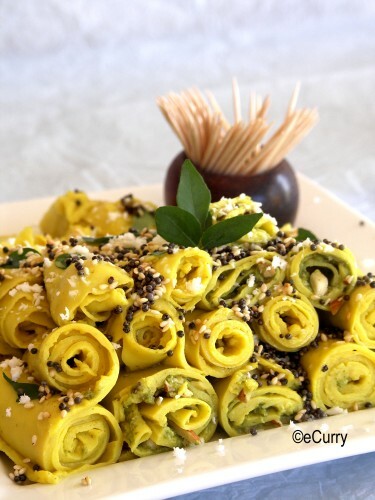 Spread them evenly over rolled Swirls/Khandvi. Serve them immediately garnished with coconut grates and chopped coriander leaves . Enjoy these soft, flavorful healthy bites. Oh yes! I forgot to say that we had these for lunch. NOTE: Don’t grease the plates/cutting board/foil with oil. The oil will make spreading the batter difficult. This is a very freestlye recipe. Layer & stuff the rolls/swirls with anything you want.. May be different things at different times for a new taste each time? Just make sure that whatever you are using for the layering cannot be a running watery consistency for the liquid with make the swirls wet & soggy. These look lovely Soma! 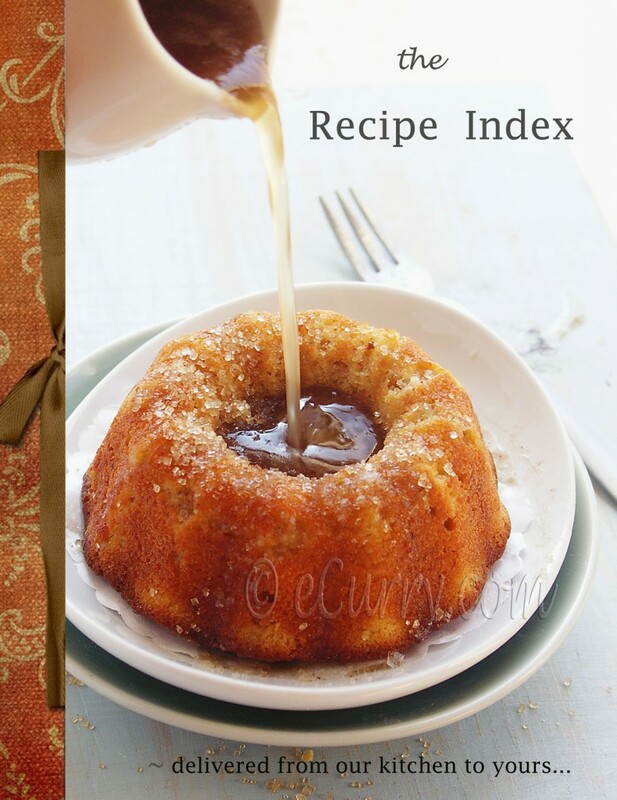 Wrong time to come by your blog though, its 4 pm, and I’m in the office frantically looking for something to munch on 🙁 I’ve bookmarked 3-4 versions of this recipe, but am scared to try the whole cooking and spreading charade! Priya. do give it a try once. that fear kept me away from doing it for so many years! with Sia’s recipe it was really easy breezy. Again,Wonderful snaps ,Soma..Couldn’t take my eyes off from the pics..
Soma, what beauties they are. Itch is good when you come up with stuff as fantastic as these. Thanks! Yes healthy itches are good..
Soma, these are gorgeous and absolutely new to my eyes (and palate)…thanks for sharing! Asha, try stuffing them next time u make them.. they feel so complete! I ve made the micro version from Sia’s They were super easy breezy! The stuffing is cool idea! Cham, Really Sia made it super easy! Thanks Trupti, I love Khandvi too! this looks fantastic Soma, the pics are droolworthy! I make the micro version as well, your pics are absolutely amazing!! Thanks Aqua.. I think after making these in the mw.. i find the mw to be much easier! I too love khandvi but it is my daughter who is the fan! I love your layered fill. Good idea and awesome, awesome clicks!! Tomar chobi gulo praise to the power infity kore chere dilam … koto ar roj roj bhalo bolbo … ki bolo 🙂 Oshadharon!! This is BRILLIANT. The pictures are so beautiful, Soma! I wish I could think like this! Very cool pictures and the Khandvis ( stuffed as well as the non-stuffed) look beautiful. I have bookmarked this many time from other blogs but haven’t tried it myself. Supriya Thanks! This was really easy & quick! It looks so beautiful… I even imagining it as roses! Thanks Selby! yellow edible roses? Wow, gorgeous! And these swirls sound absolutely delicious! Mouthwatering pics… Have tried kandvi. Need to better it. The idea of filling is superb. shall try that next time. 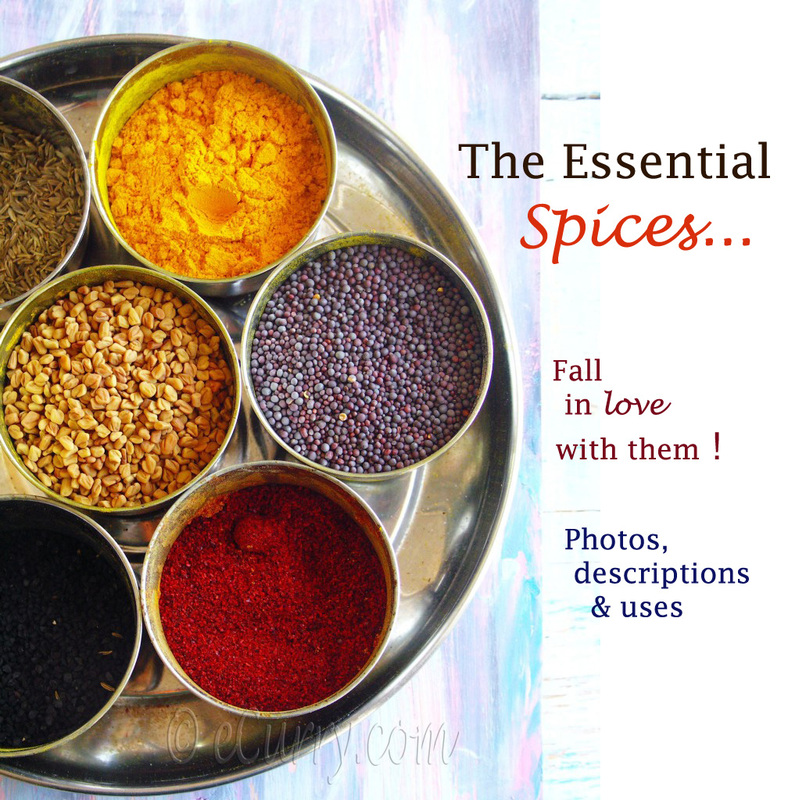 they look wonderful..have never tried making..mw version sounds superb..will give ita try..
Sowmya do try it. the mw version is really easy & quick! I have never had this, i only knew about them after starting to blog, wish i could have a taste, looks so beautiful. HC these taste awesome:-) Give it a try if you get a chance! Sia Great minds think alike! My 7 year old daughter had khandvi for the first time, & she loved the layered one.. didn’t like the plain one at all. Lovely pix, as usual. I never thought of these on toothpicks. Always get them from our friendly neighbourhood Gujarati halwai! I’ve seen pieces of jackfruit being passed around as cocktail snacks, though. I wish I had one gujrati halwai.. to satisfy my cravings:-) Jackfruit as cocktail snacks? what kinda jackfruit? They look fantastic! Another new and interesting recipe! I never saw such perfectly groomed khandvis in my life. Gorgeous. After seeing your stuffed version, the old khandvi will never be the same for me. hehe Aparna..:-) Try the stuffed ones, they taste goooood! Hurray…awesome awesome..Soma,you are a proffesional photographe ror what ? great friend..i have grabbed many from the tray. Thanks Ann! & no I am not a Professional photographer. how I wish i was! Can you start teaching food photography classes? pretty please? I need to take some classes Jennifer:-) I am managing here with some paper backgrounds & a camera & hope of some sunshine. i always wanted to try kandvi.. i will try this one, when i am ready to make. looks mouthwatering!! nice pic. Just beautiful Soma. The pictures are stunning too! Well done! Rashmi, I would love to take up a job that would pay me for writing menus!! Find me one! very nice! 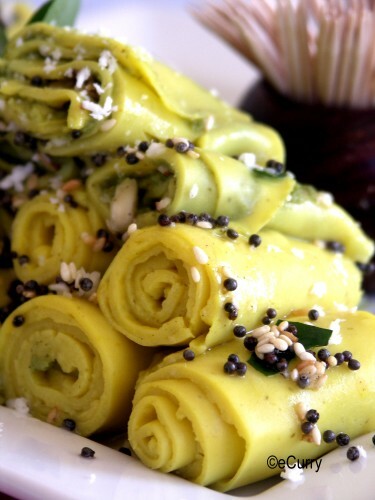 I love your title for the khandvi! im all over this microwave version! Woww…these look fabulous! They look just perfect as finger food for a party. You’ve taken the pictures so professionally. I love chickpeas, they are so healthy. This looks so so tempting ! and as usual – wonderful photography ! This looks so so tempting ! oh, yea. i can eat a hundred at one sitting. Gorgeous creation! I rarely overeat, but these, oh my! So beautiful! And they sound incredibly addictive, too. what a great idea! Wonderful! Even I haven’t made khandavi so far and every time I see a blog post with it, I get tempted to make. Have to give it a try. 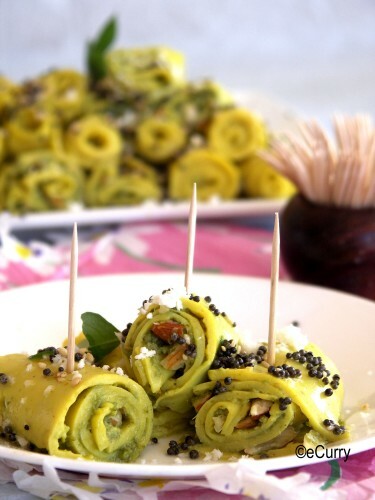 I’ve never tried Khandvis, but these look fantastic! They’re so pretty, and they would make great party food! I am definitely going to try this one. I love the photo. It just made me crave or some chickpeas right now.